Early in his career at the University of Washington, Peter Chen, MD, approached William “Bill” Parks, PhD, who was then leading the Center for Lung Biology, with a new theory about the proteoglycan, syndecan-1, as it relates to the basic mechanisms of lung injury and repair. Given his mentor’s advice and the necessary autonomy, Dr. Chen quickly established himself as an authority on the protein. Since then, he’s authored and co-authored several papers on the subject, including “The Transmembrane and Extracellular Domains of Syndecan-1 Have Distinct Functions in Regulating Lung Epithelial Migration and Adhesion,” published in 2012 in the Journal of Biological Chemistry. He’s also acting as principal investigator in two studies—“Syndecan-1 in Lung Repair” and “Syndecan-1 Regulation of Influenza Infection”—both funded by National Institutes of Health. These days, Dr. Chen is focusing just as diligently on the success of others. As director of the Division of Pulmonary and Critical Care Medicine at Cedars-Sinai Medical Center in Los Angeles, Dr. Chen leads a faculty of 16, including his old mentor, Dr. Parks, who is the scientific director of the Women’s Guild Lung Institute at Cedars-Sinai. Dr. Chen joined Cedars-Sinai in 2013, after being on faculty in the Division of Pulmonary and Critical Care Medicine at the University of Washington, where he completed his Pulmonary and Critical Care Fellowship in 2005. Dr. Chen has been charged with making his division more academic. “Traditionally, the fellowship program at Cedars-Sinai was a very clinical program,” Dr. Chen says. “We are making it a more academic program and have created a dedicated research track in which we have current fellows as well as will continue to recruit prospective fellows into. The plan is to develop trainees into physician-scientists and lay out the steps to become the next Paul Noble. Dr. Chen earned his medical degree at Baylor College of Medicine in 1999 and completed his internal medicine residency at University of Texas Southwestern Medical Center in Dallas in 2002. After finishing his fellowship, he continued as a research fellow at the University of Washington before joined as faculty in 2007. 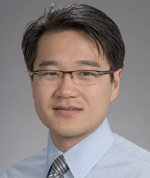 As chair of the ATS Members in Transition and Training Committee, of which he has been a member since 2008, early career professionals are Dr. Chen’s primary focus. Work-life balance was one of the topics discussed during the Faculty Development Series, but with a baby boy, another son and daughter younger than 10, Dr. Chen is just happy to get in an early morning run before the family wakes. It also helps that Dr. Chen’s wife, a pharmacist, agreed that the family would indeed relocate along with him to Los Angeles. “I couldn’t have done anything I’m doing now without her support,” Dr. Chen says.